Normal uterine bleeding is defined as cyclic menstruation every 21-35 days that lasts fewer than 8days with 20-80ml of blood loss. For practical purposes, any patient who complains of a change in her previously established menstrual pattern may be considered to have abnormal uterine bleeding. Polymenorrhoea is uterine bleeding at the interval of fewer than 21days. Oligomenorrhoea is uterine bleeding at the interval of more than 35days. Menorrhagia is excessive bleeding at regular intervals. Metrorrhagia is bleeding at irregular intervals. Menometrorrhagia is heavy irregular bleeding. Intermenstrual bleeding is bleeding between regular intervals. Non-organic /Dysfunctional uterine bleeding: when an organic cause cannot be found. 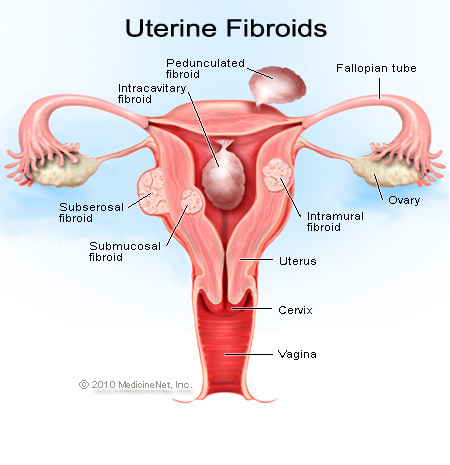 – Benign disease-fibroid, polyp, infections, endometrial hyperplasia. – Trauma or foreign body. Laboratory evaluation, possible imaging studies and tissue sampling. Onset, duration, frequency, amount and pattern of bleeding. In addition degree of associated pain, vaginal discharge, fever, nausea and vomiting should be clarified. Other sources of bleeding such as bleeding from GI tract, or urinary tract, should be ruled out. For women of childbearing age, sexual and contraceptive history should be explored to help determine likely hood of pregnancy. Menopausal symptoms should be explored in appropriate patients. Any change in diet, weight and exercise are relevant. Patient’s age, parity, hormonal contraception or hormone replacement history, past medical history, gynecologic and obstetric history and medication regimen are pertinent to the evaluation. First ensure that patient is hemodynamically stable. If the patient does not require immediate resuscitative intervention, attention should be directed to abdomen and pelvis. Abdominal examination determines the patient has an acute or surgical abdomen that requires urgent surgical intervention. Inspection of the vaginal vault can determine the degree of current bleeding, the source of bleeding, discharge suggest of infection, trauma, lesion, polyp, tissue or masses. Bimanual examination: To determine the status of internal os, the presence of cervical motion tenderness, the presence of any palpable mass or lesion, size and contour of uterus and adnexa, the presence of any tenderness on manipulation of any pelvic organ. Finally , more specific physical findings can be associated with abnormal uterine bleeding caused by systemic diseases. Threatened, inevitable, incomplete or missed abortion.